Simple, fast and packed with taste. 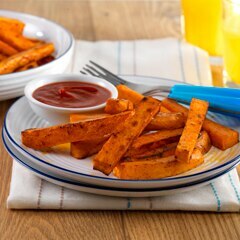 The perfect combination of spices and Country Crock® make these Sweet Potato Fries great. Preheat oven to 350°. Line shallow baking pan with aluminum foil; set aside. Combine chili powder, garlic powder and paprika in small bowl. Toss potatoes, melted Country Crock® Spread and seasoning mixture in large bowl. Turn onto prepared baking pan. Bake until potatoes are tender and golden brown, turning once, about 20 minutes.